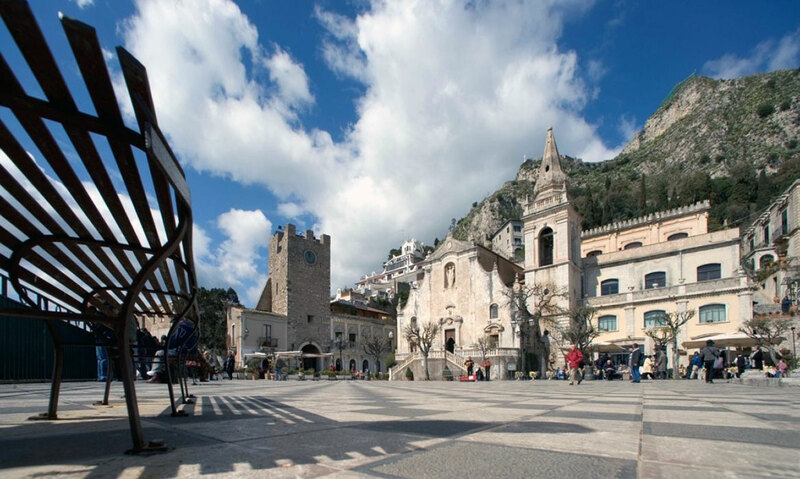 Taormina is a mythical city full of the intense fragrance of jasmine, the sound of crickets and cicadas, the International Film Festival, restaurants, breathtaking views, charming hidden corners, and the unforgettable people called the “Taorminesi”. At an altitude of 200 meters, Taormina is a literal balcony over the Ionian Sea and Mount Etna. 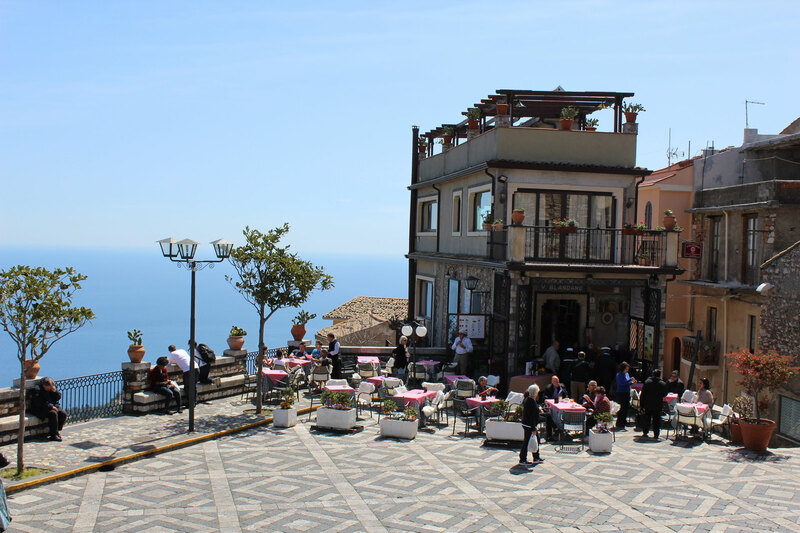 A mild climate and genuine hospitality on the part of the Taorminesi have made this Sicilian town a favorite destination for tourists from all over the world. Just wandering around the old streets and alleys adorned with jasmine and bougainvillea flowers is an experience in and of itself. You experience the beautiful stone palazzi, lava steps, and charming surroundings all colored by exotic flora, then stop in one of the small local shops to find colorful Sicilian ceramics, lace, paintings by local artists, special antiques, reproductions of Sicilian carts, and objects made of local lava stone. 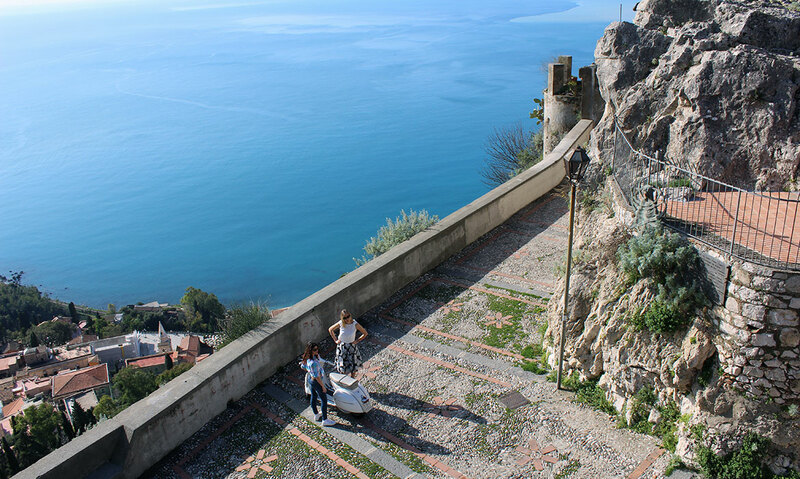 Follow in the steps of the most important writers and artist that began in the 19th century to visit Taormina: Goethe, Maupassant, Nietzsche (who wrote his ‘’Thus Spoke Zarathustra” here), Oscar Wilde, and others. Since then the city of fishermen, farmers, and wealthy bourgeois became the residence of elite tourism. Among the narrow streets and ancient buildings you can see monuments and architectural remains of particular beauty, testimonies to the different cultures that over the centuries have written the history of Sicily. For the Greek civilization the theater was the maximum expression of art. In ancient times when there were no lights or special effects, it was the unique position within the spectacular and magical scenery that made the difference. 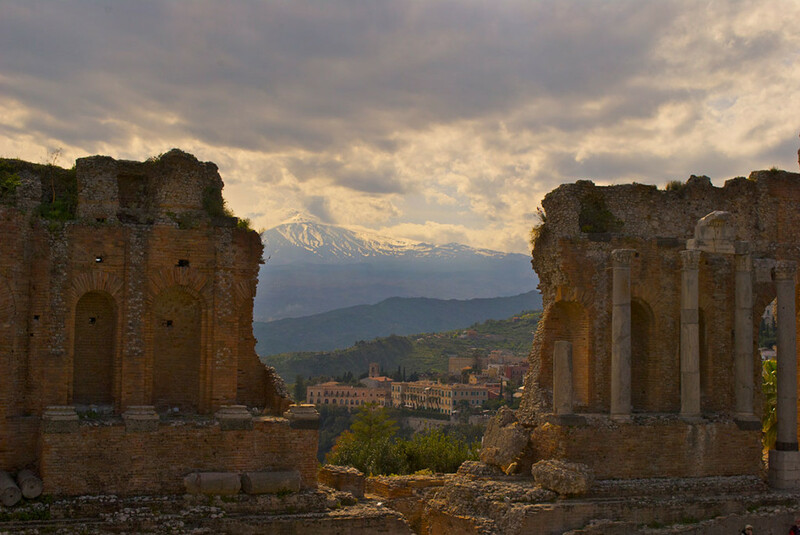 The Ancient Theatre of Taormina is set in an idyllic location, with the Ionian Sea and Mount Etna in the background, the place that enchants without even seeing the actors performance. Goethe, who saw this spectacular panorama in 1797, declared: ‘’Never did any audience, in any theatre, have before it such a spectacle’’. Constructed during the Greek Hellenistic period, the theatre was literally carved out of the rock on Monte Tauro, and had a capacity of 5,000 spectators. The Ancient Theatre is the second largest of its kind in all of Sicily behind only the Greek Theatre of Siracusa, and because of its perfect acoustics it is used still today for theatre performances. The San Domenico’s history begins with Damiano Rosso, a descendant of the Altavilla house and Prince of Cerami. He became a friar, donated all his property, including the palace that was transformed into a convent of the religious order of the Dominicans. In 1886 the heirs of Rosso Altavilla, were able to take possession of the building that was then converted into one of the most famous hotels in all of Italy. The San Domenico will enchant all those who want to feel the ancient monastic atmosphere, including the two magical and charming cloisters, the sacristy, images of saints, and the rooms that were once quiet monk cells. You can retrace the steps of famous stars of culture, science, politics, and show business – the hotels original guests. To quote just a few: King Edward of England, Sofia Loren, Richard Strauss, Marlene Dietrich, Ingrid Bergman, Audrey Hepburn, and many, many others. One of the most important women in Taormina’s history was Lady Florence Trevelyan, close friend to Queen Victoria and her son Edward. Born into an ancient Scottish family, Florence married Professor Cacciola, the mayor of Taormina and moved to his house surrounded by a magnificent park. Lady Florence spent her time rearranging the immense English – style garden and planting many rare species of flora. The extraordinary eclectic towers, inspired by oriental buildings, that she called ‘’Beehives’’ are still the main attraction of the park. 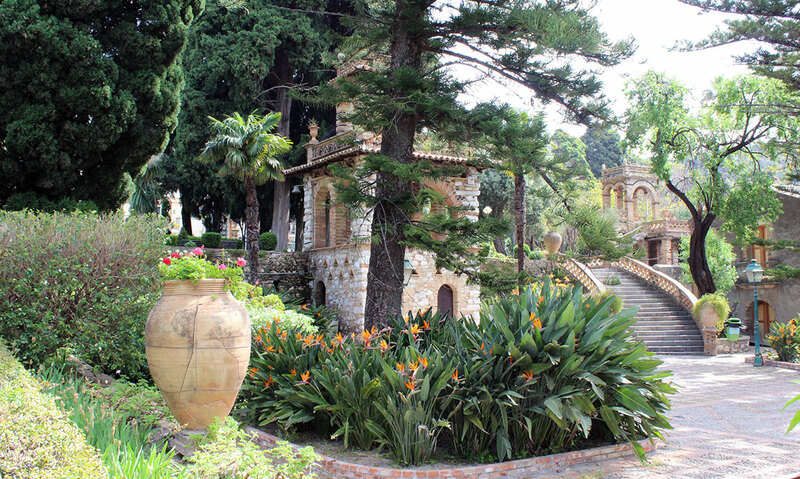 She hosted in her private, shaded garden the most important people of that époque: Wilhelm II German Emperor; Nicholas II of Russia; Oscar Wilde, Nietzsche, and many others that made Taormina famous throughout the world. In 1923 the park became the property of the town and was open to the public. Villa Comunale is settled on the slopes of Mount Tauro and blends in harmoniously with the natural environment: the bay of Naxos and, in the background, the snow-covered peak of Mount Etna. Corso Umberto I, the main street of Taormina lies between two arches, Porta Messina and Porta Catania, and was an integral part of the ancient Via Valeria, which once connected Messina to Catania. Today Corso Umberto is a beautiful fashionable pedestrian street full of boutiques, typical restaurants, and charming cafes. There are lots more hidden away in the backstreets, like the most narrow street of Taormina – Vicolo Stretto. Corso Umberto, called simply by locals ‘’Il Corso’’, is the very heart of the city where all can be seen practicing the very singular sport, cuttigghiu, which in local dialect means gossip. Don’t be surprised to be in center of attention of the Taorminesi walking along ‘’il Corso’’ where the facts and suspicions of both public and private lives are daily commented. Once a refuge of hermits, the church of Madonna della Rocca, built in the twelfth century, rises on a small mountain overlooking Taormina which offers a marvelous view of Mount Etna. It owes its name to the rock in which it is carved and built. If the church is open you can reach the beautiful open space with a big cross that dominates Taormina. Legend says that during a storm a shepherd with his flock hid inside the cave. He saw, in the crack of lightning, a lady with a baby in her arms. Frightened, he fled, leaving his sheep. He later returned and found a crack in the rock where there was left the shape of the lady with the baby. The small cave became a place of pilgrimage for many believers who still today visit the church every third Sunday of September to celebrate the Madonna della Rocca. The little island of Isola Bella – formerly called Santo Stefano – is connected to the mainland by a short sandy path, submerged or above sea-level depending on the tide. The island is landscaped with a series of small terraces linked by small stairways and pathways. Lady Florence Trevelyan, bought Isola Bella, built a charming house and established a garden there that became the home of various sea birds. After Florence’s death Isola Bella stayed in private hands until 1990 when it was taken over by the Regional Government of Sicily who designated it a Nature Reserve. Castelmola is like an eagle’s nest clinging to a rock peak at an altitude of over 500 meters. It is a small but enchanting medieval city situated just above Taormina. From the scenic area of the castle you can admire the imposing Etna overlooking the Gulf of Naxos, the town of Taormina, and the coast of Calabria. Castelmola has a network of tight charming step ways perfect for a relaxing walk. It is a wonderful experience to get lost between small stone houses where cats nap in the lazy Sicilian sun. 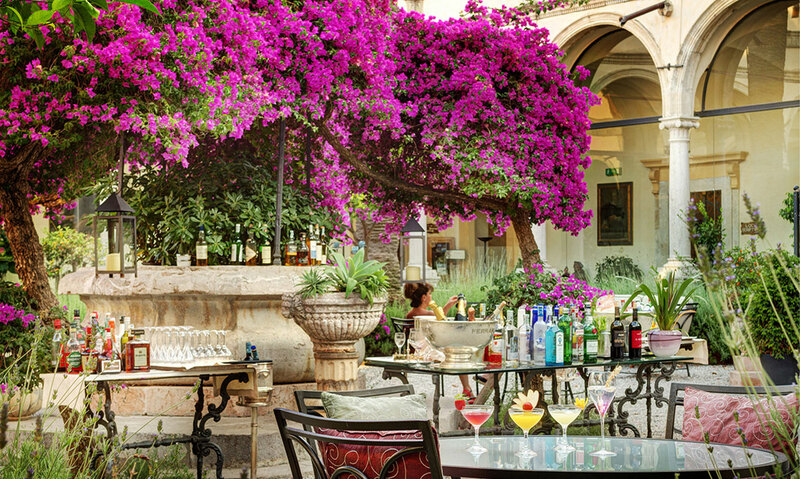 Don’t miss the bar San Giorgio (St George), founded in 1700 by monks who used it as a tavern. Many years later, Don Vincenzo Blandano turned it into one of the most typical bars of the town, where since 1907 he has collected in his ‘’guest book’’ signatures and thoughts of visitors, including those of some illustrious men of the twentieth century. In the early years of the twentieth century between the various infusions prepared, Don Vincenzo, using the ancient techniques of Greek infusion, created the almond flavored wine that he called its “Blandanino”, a mysterious dark amber liquor made of different smells and tastes of his Sicily. 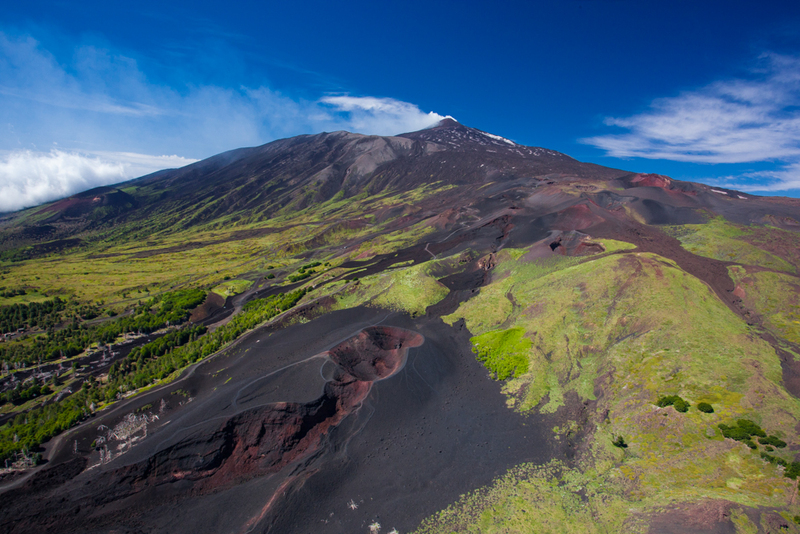 Mount Etna is the highest, most active, and most fascinating of the European volcanoes. From its top you can admire the blue of The Ionian Sea, the fire and the smoke that erupts from the main crater, and, for the most part of the year, the snowy white slopes. It’s impossible to count the numerous activities of the volcano and even though she is in constant transformation she remains one of the most beautiful successes of landscapes on this planet. From coastal cultivation, to plains that pass through citrus, olive groves, and grape vineyards, Etna creates a harmonious space and landscape typical of a volcanic desert. The Greek poet Pindar was one of the first to describe the eruption of Etna. For the ancient Greeks, Mount Etna was the laboratory of their god of fire Hephaestus, where he melted special tools: arms of Achilles, winged sandals of Hermes, or thunderbolts of Zeus. Due to its history of recent activity and nearby population, Mount Etna has been designated a Decade Volcano by the United Nations. In June 2013, it was added to the list of UNESCO World Heritage Sites.